Opera Software has unveiled Opera 32 FINAL, a new release of its desktop browser for Windows, Mac and Linux, with an Android update due to follow. Version 32 is another build light on major new features, with the company keen to promote its recent acquisition of the SurfEasy VPN service. What has been added is password sync, a new view for bookmarks and support for animated background themes. Opera has used this new release to advertise its recent acquisition of SurfEasy, a VPN service that includes a free package with a 500MB monthly transfer limit (unlimited packages cost $3.99/mo for desktop, and $2.49/mo for mobile). The company hints at plans to incorporate SurfEasy features into future versions of the browser, but for now this is limited to promoting the new product within Opera itself: the advert can be found under Settings > Privacy & Security or in a new Private Browsing window. Elsewhere, changes are minimal, but welcome. 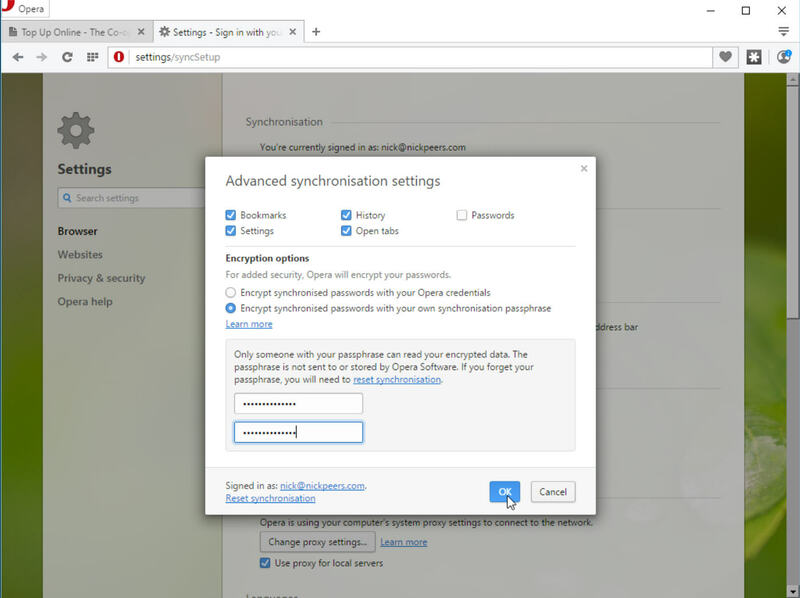 Opera has added passwords to its list of settings that can be synced -- click the user icon to the right of the Address bar and select 'Choose what to synchronize' to add passwords to the list. Passwords are encrypted for security reasons, and users have a choice between accepting their Opera credentials or by adding an additional synchronization passphrase for greater security. Elsewhere, users gain a new 'Tree view' for bookmarks in the left-hand pane that makes it easier to navigate large groups of folders, while support for animated background themes has also been added. Browse to Themes and click 'Get more themes' to see what’s available -- animated themes are marked out by a play button that allows users to preview the theme before adding it. The Android version will be rolling out in the Store shortly -- new features could include an 'Add to Home screen' option and the ability to synchronize typed history based on what’s currently in the beta version. Opera FINAL 32 is available now as a freeware download for Windows, Mac and 64-bit Linux users, with the Android version due imminently. Also available are Opera Mini for Android, which recently added a new "High" savings mode and full-screen tab gallery, and Opera Mini for iOS 10.2.